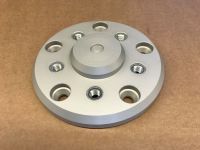 My latest project - Disc Brakes for a 710/712 - Page 4 - THE PORTAL HUB - Pinzgauers, Haflingers, Volvo 303s and more! Haf-e wrote: Its worth noting that Sprinters in Europe come typically with 15 inch wheels - so that isn't probably a good option in Europe then. The brochures I could download on both the Swiss and Austrian MB website seem to mention 16-inch wheels, with 235 65-16 being the typical tire size. Correct, 6 lugs on the recent Sprinters... sorry I should have checked before posting. Was able to do a test fitting of a Euro-type Transit 16 inch wheel on the disc brakes - it looks like they will require the same thickness of spacer as the Sprinter wheel and so will require an "adapter" type spacer (i.e. 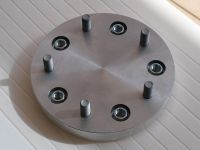 one which uses the stock lug bolt to attach the adapter and then has five additional lug bolts for the wheel to attach. The outer edge of the Transit wheel appeared to be at the same position as the outer edge of the Sprinter wheel - so a very reasonable amount of offset in my opinion. I was able to test fit one of the Ford Transit wheels with the disc brake conversion using an adjustable spacer I improvised. Looks like they will work very well with only a small increase in the spacer thickness compared to the Sprinter wheels (about 1/8 inch or 3/16th of an inch). In this first photo the angle of the camera and the camber of the wheel with it in the air while up on the jack make it look like the tires stick out more than they actually do - the edge of the tires tread is actually even with the outer edge of the wood rub rails when the wheels are in a vertical orientation (i.e. with a small typical load in the Pinz). Last edited by Haf-e on Sun Sep 03, 2017 11:17 pm, edited 2 times in total. Can you knock up some disk brakes for the front of my haflinger? After your great effort here, the haflinger should Easy Peazy. Haflinger is so small, light and slow, plus there are so few of them - it would not really be worth it. Would be a fun project if someone needed something to do but I find Hafi brakes work very well. I am interested too - esp since I already have 2 correct spacers (from a different need). "The width of 29mm was chosen in order not to exceed the widening of 4% permitted by the Austrian legislature"
So the additional width for the disc brakes of 1 inch on each side (<26mm) should be compliant at least in Austria when using the Sprinter wheels. I don't see why everyone is so hung up on transit wheels. For guys in the U.S., why not just get a wheel adapter. For around $300 you can get them and then you can use any wheel you want. Ford, chevy, jeep whatever bolt pattern. Custom wheels any rim size, offset etc. Wyothing wrote: I don't see why everyone is so hung up on transit wheels. For guys in the U.S., why not just get a wheel adapter. For around $300 you can get them and then you can use any wheel you want. Ford, chevy, jeep whatever bolt pattern. Custom wheels any rim size, offset etc. And the look of most aftermarket wheels. especially US versions, just don't fit exotic Euro 4x4 styles, in my opinion.